In mid-June 2017, a new, redesigned and upgraded version of the Pub Peer website was launched. Along with the new design, users will notice new formatting options for comments, which can now include images and equations. However, the creators of PubPeer highlight that the most important innovation has to do with identity management and the handling of user information, aimed at keeping users anonymous. PubPeer was launched in 2012 with the idea of enabling members of the global research community to comment journal article. It is intended to serve as a platform for scholarly discussion and post-publication peer review. Although this has not been the primary goal of PubPeer’s creators, it has become one of the most important platforms where users can report and publicly reveal non-reproducible results, violations of professional ethics, fabrication of results, plagiarism and other forms of misconduct. The great popularity of the website and a huge number of comments so far submitted can partly be explained by the fact that the commenters remains anonymous, unless they wish to disclose their identity. 1. It relies on a database that contains articles from scholarly journals. In order to make a comment on an article, a user should perform a search using an article unique identifier to locate the article. 2. Users who want to make a comment on an article do not have to register a user account and do not have to disclose their identity. The status of registered users is reserved for the authors whose papers are stored in PubPeer’s database, but even they can comment anonymously, if they wish. Anonymous comments are moderated. 3. PubPeer notifies authors as soon as their article is commented on. 4. 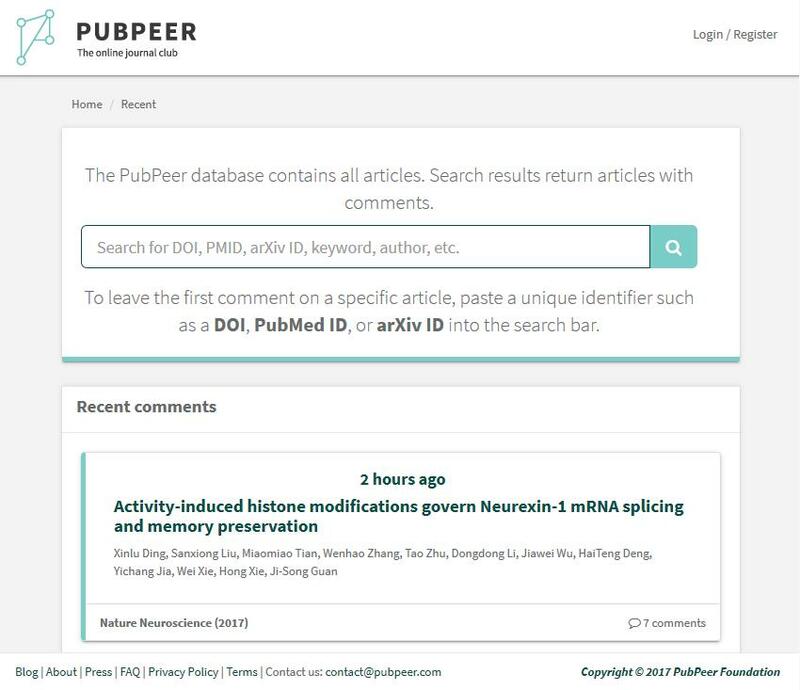 PubPeer’s creators have developed browser add-ons that add links to existing PubPeer comments on journal websites, publishers’ platforms and bibliographic databases. From the outset, PubPeer has given rise to diverse opinions – from support, to harsh criticism. Its critics usually highlight the risks associated with public commenting: negative comments may often be interpreted as accusations, and researchers mentioned in these comments may be publicly assumed to be guilty without proving their responsibility for the alleged misconduct. The website was particularly criticized for the anonymity of comments. It has been pointed out that anonymity may encourage irresponsible and unfounded claims. The creators of PubPeer believe that the anonymity of comments encourages scholarly discussion. According to them, it is necessary to ensure anonymity because scholars are generally reluctant to criticize the work of their colleagues in public; conventional peer review fails to efficiently detect and eliminate errors and negative practices; journal editors and publishers are not always ready to publish the correction of reported errors, and the whistleblowers are usually exposed to pressures and threats. PubPeer's comments exposing unethical practices often initiated debates and investigations that led to retractions or corrections of disputed articles. In other words, it turned out that the criticism presented in the comments was founded. Some disputes ended up in court – e.g. an author of commented articles sued the (anonymous) commenters on PubPeer for the damage inflicted on his reputation. Along with anonymous (unregistered) commenters, and registered users (authors of commented papers who prefer to disclose their identity), the new version of the website supports another type of users – anonymous registered. Upon registration, these users are assigned a pseudonym to be used when commenting. Although their identity will still be hidden, the pseudonym allows to track comments made by individual users, as well as to compile a list of trusted accounts.